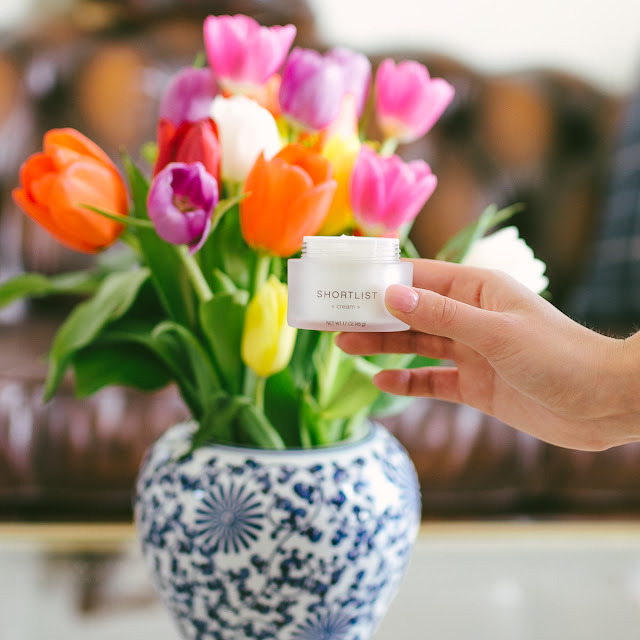 Today I'm partnering with Shortlist Beauty to talk to you guys about this amazing new skincare line! 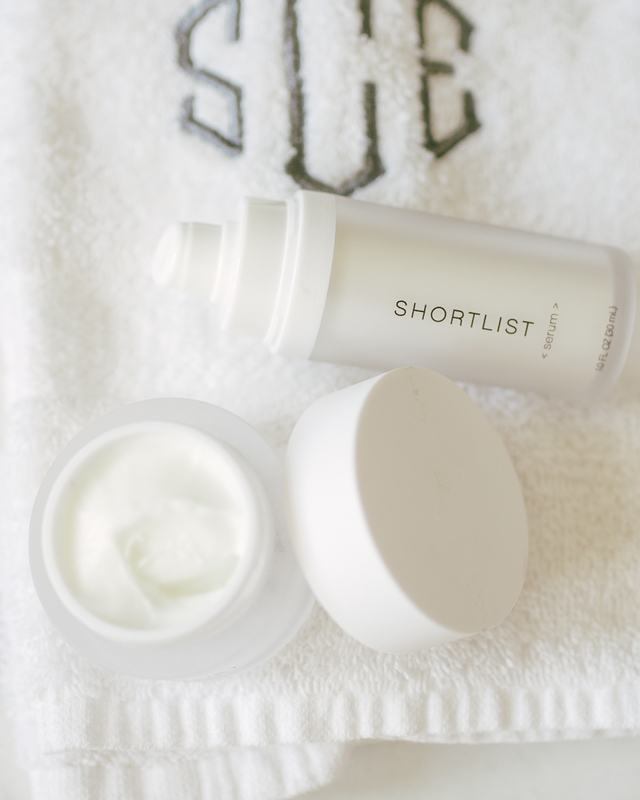 The idea behind Shortlist is that it is just two products: a serum and a cream. The brand wants to simplify your beauty regimen without sacrificing performance or quality. Sounds pretty great, right? Shortlist sent me a set of the serum + cream to try out and I have been loving it so far. 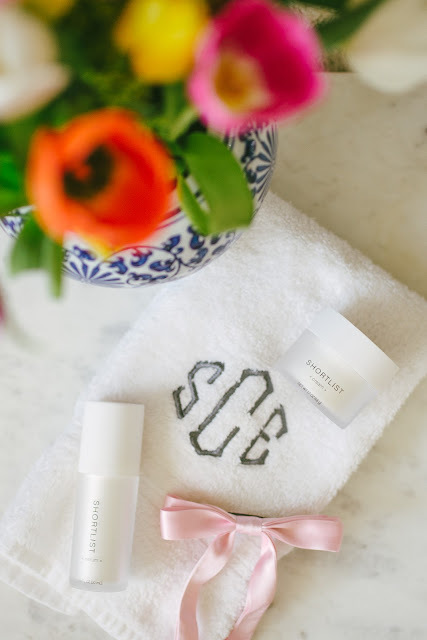 I am such a skincare junkie and I'm always up for trying new products, but whenever I love something, I add it to my routine and then that becomes another step. With Shortlist, it's helped to cut down on my lengthy routine and it saves me more than half the time! 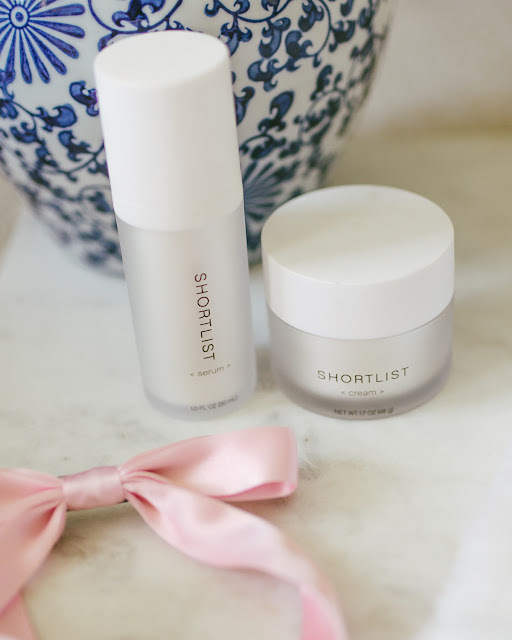 One of the reasons I love this product best is because of the name: Shortlist. The name comes from the fact that their products have been stripped of fillers and only contain the products necessary to 'work' on your skin. The cream has 9 ingredients and the serum has 11! I encourage you to look at the ingredients in some of the skincare products you use. I did and I was so shocked by just how many ingredients are in even just a moisturizer. Both the Shortlist cream and serum have zero parabens, phthalates, sulfates, colorants, fragrances and mineral oils. I have really sensitive skin, so it's good to know that what I am putting on my face with the Shortlist duo is clean. I've been applying both morning and night (first the serum, then the cream). Thanks to the retinol in the cream, I've noticed clearer skin, and thanks to the serum, I've noticed glowy, even skin (it has niacinamide, hyaluronic acid, and glycerin). If two products can get me these results in just a few weeks you can consider me a convert! This is a sponsored conversation written by me on behalf of Shortlist Beauty. The opinions and text are all mine. This week started off with such a bang- busy, busy, busy, and now it has slowed down, which is great! I'm looking forward to taking the day off tomorrow for Good Friday and spending the weekend relaxing with family and friends and then celebrating Easter on Sunday at my parent's! Last week, Henry started to act unlike himself (around Tuesday). He's usually an angel dog and always by my side. However, he started to bark at me when I wasn't paying attention to him (he never barks), he was 'inappropriate' to one of my girlfriends when she was over (if you know what I mean... he has NEVER done that before), he stopped sleeping in my bed for two nights, and he begged incessantly for attention in a rude way. Not to mention, he started going under my bed. It was the oddest thing ever. I was worried he was sick or just turning into a bad dog. But, I thought it might have been because he hadn't been going on long walks (last Tuesday-Thursday) because of the crazy spring snowstorm and bitter cold we had. So I thought he was bored and I felt really guilty. I ordered a bunch of 'mental stimulation' toys on Amazon so he had plenty of things to play with and I played with him extra/ gave him so much attention while stuck inside. Once the snow was done, I took him on extra long, tiring walks!! I also did more research and I think he might think he has become the 'leader of the pack' because he is so spoiled (my fault). He still wasn't 'better' by Thursday of last week after I got him the toys and started to be stricter/show him who is boss. So then I did some more research and I was thinking (and I feel a little crazy even mentioning this) that both Jupiter and Mercury are in retrograde. I normally don't feed into that kind of stuff, but I know that animals truly do react to full moons, so I'm wondering if the double retrograde affected him? Who knows! So now, I have been trying to reassert myself as boss and as of this Monday, he has totally returned to his typical loving, sweet, well-behaved self. He's been stuck inside more than usual from last week's snow storm and this week it has poured rain constantly (I thought March was supposed to be in like a lion, out like a lamb... where is that lamb?!). But he has still been so good and I am SO glad. Poor guy is so used to warm, sunny Texas. I keep telling him 'I swear it gets warm and sunny here in Pittsburgh and we can go outside all the time just like in Texas!' 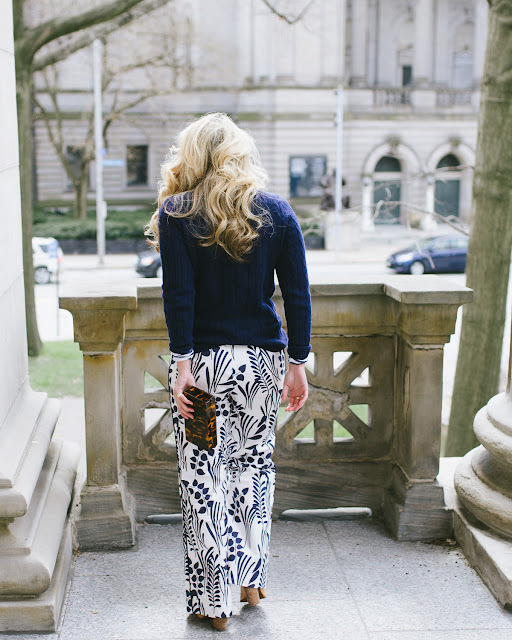 Here's to hoping that warm sunny weather will arrive sooner than later. 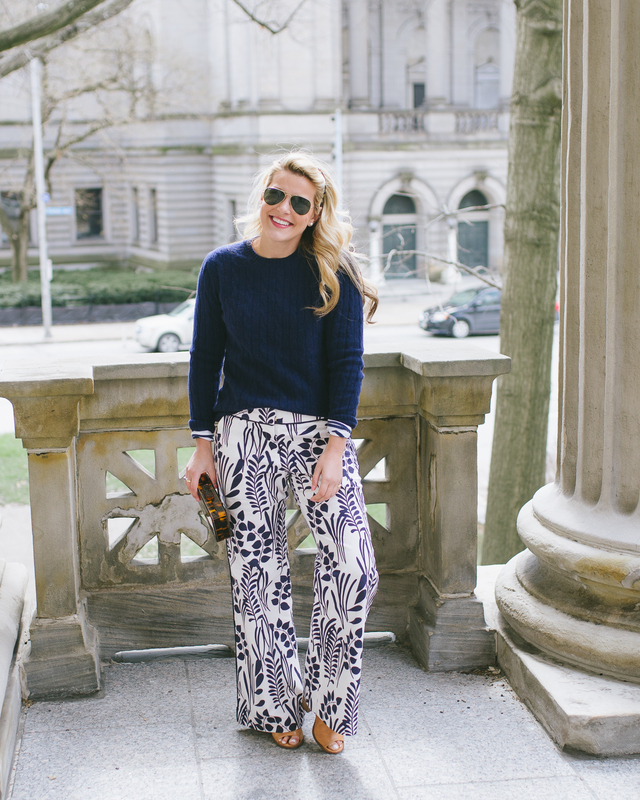 Wearing: I've been getting so many questions about the sweater and striped top combo I am wearing in the photo above! This is from the morning of St. Patrick's Day when I realized I own very little green. This was a brand new purchase so I was glad I had it! I was actually unfamiliar with the brand before I ordered but I love all the pieces and the prices were decent, too. 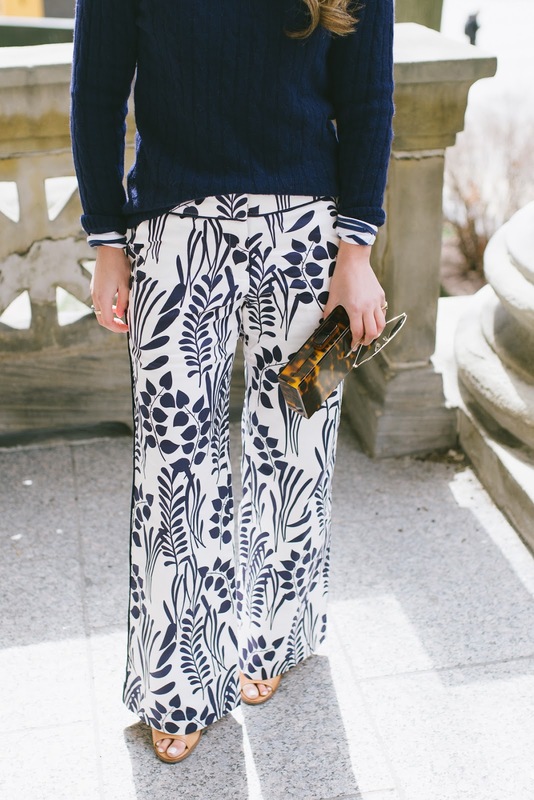 It strikes a really nice balance between classic and preppy! 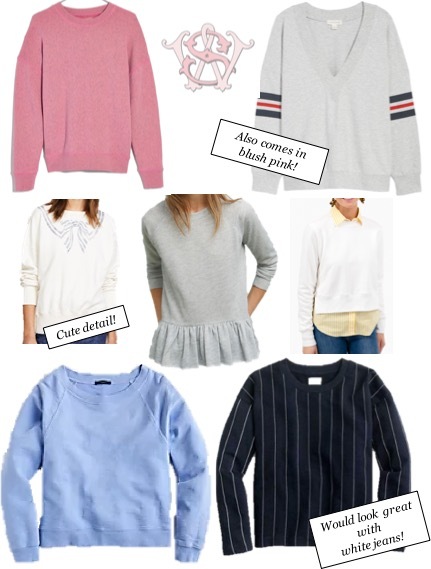 The pieces were good quality and I found the sweater to run true to size while the shirt definitely runs small- I would size up at least one size! I just ordered this dress (also love this dress) after loving my other two pieces and I am excited for it to arrive! Eating: I'm oddly obsessed with dishes with cabbage. I came across this soup recipe and I am going to make it ASAP. It sounds SO good. Drinking: If you are a fan of Trader Joe's sparkling water like me, I just found out they now make it in cans instead of the big bottles! I am so excited because I would never drink the bottles fast enough before they would go flat! Reading: This article is a bit older (from this past fall), but the basis of the article is asking people when they started to feel old. It's a good read and I can relate to feeling old sometimes! Sale-ing: Barney's has always had some really great shoes, but right now, they are having a huge sale that is definitely worth taking advantage of. The shoes are always well made and high quality! Scroll through the widget above to see my favorites! Watching: I started watching Billions on Showtime a while ago and only got to episode 6. I gave it another try and I love it! I think the key to the show is that you really need to pay attention- no working while it's on, no scrolling on your phone. Listening: It's not even April yet and I have a solid April playlist! I've felt so uninspired with music lately that I'll typically just listen to old playlists. But I've just started to find some newer music that I am loving! Loving: How cute is this little gingham wallet? I have one just like this and use it every single day. 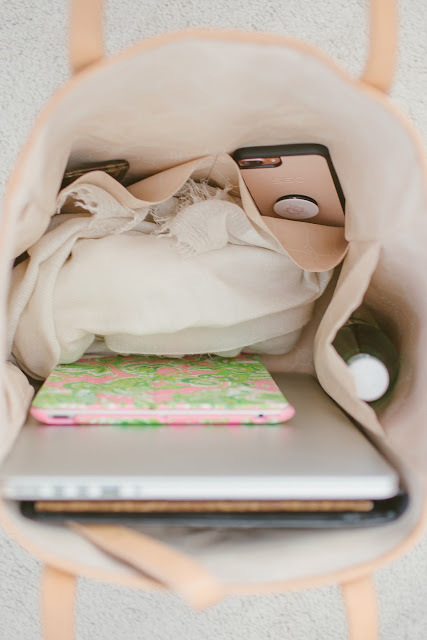 It's so easy to just run out with just that and not have to bring a bag with me! Wanting: So many good things this week! 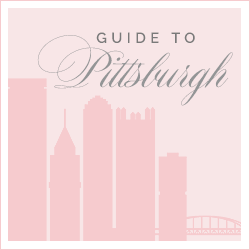 Pittsburgh is still not even close to being warm, which is such a letdown, but I'm hopeful! I'm particularly fond of these mules that look very similar to Belgian loafers but they're priced sooooo much less! Pittsburgh-ing: This past weekend, I went to Driftwood Oven, a casual BYOB pizza place in Lawrenceville. It was SO good I actually thought about not sharing because it's such a well-kept secret. This is some of the best pizza I have ever had. It's special because the dough is actually sourdough! They had so many options and we ordered one of each pizza. My favorite was the sausage. I can't wait to go back! Quoting: 'Any fool can know. The point is to understand.' - Albert Einstein// See more of my favorites, here. I'm such a sweatshirt girl. As soon as I get home, I change out of my 'real' clothes and into lounge-friendly clothes. I have two sweatshirts that I got in Nantucket and I think they are my most-worn lounge item ever. I bought them a size bigger than I would normally wear so they're extra comfortable and they also have a very good lived-in feeling. However, they're not exactly the 'cutest'. Since they're a size big and they're just plain with the word 'Nantucket' on them, they feel a bit frumpy. I typically just wear them in my apartment/when I'm taking Henry out. But I probably wouldn't wear them when out running errands (here's a look at what I wear while running errands). With the weather hopefully going to be warming up soon, I wanted to find some cute crewneck sweatshirts that I can wear while running errands, lounging, and walking Henry. I have a lot of zip-ups and mock necks, but there is something so comfortable about a simple crewneck sweatshirt. The brand that inspired this post is The Great. It's made by a duo of women who are also behind Current Elliot. The Great is focused on simplicity and comfort while still being luxurious. 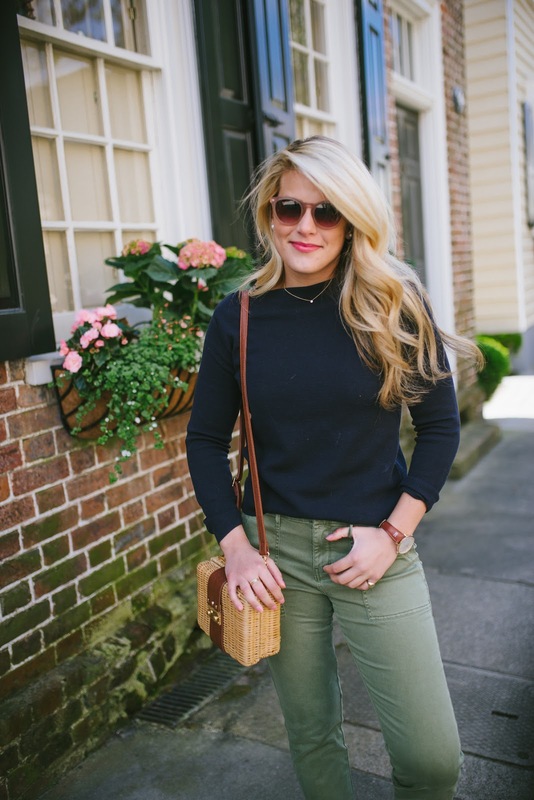 They have a line of sweatshirts called 'The College' sweatshirt and I love the lived-in, comfortable look but it also still looks like something you could wear out in public. They also make matching sweatpants for lounge that look incredibly comfortable. However, their sweatshirts and sweatpants are almost $200/each. I'm all for spending on a quality, classic item, but I just don't think a cotton sweatshirt and sweatpants is necessarily worth that price regardless of quality... what do you guys think? It would certainly be quite an indulgent purchase, at least for me! 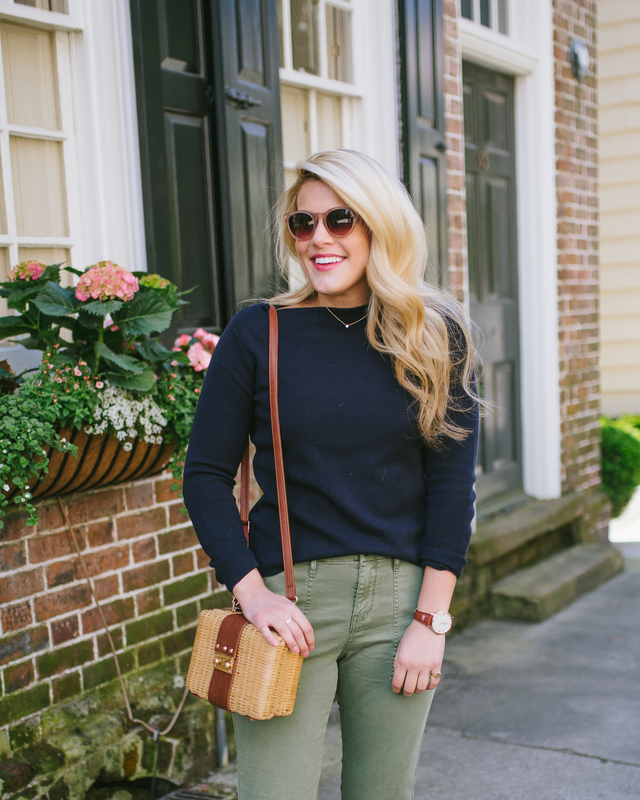 So today, I've rounded up some affordable sweatshirts that are cute and under $100! Scroll through the widget above to see more of my favorites! My two honorable mentions that are over $100: this classic navy and white striped sweatshirt, and this tennis sweatshirt. A few weeks ago, I got a press package from Under Armour and DSW. I love getting press packages because it gives me the opportunity to try a bunch of different things. However, I rarely love everything. 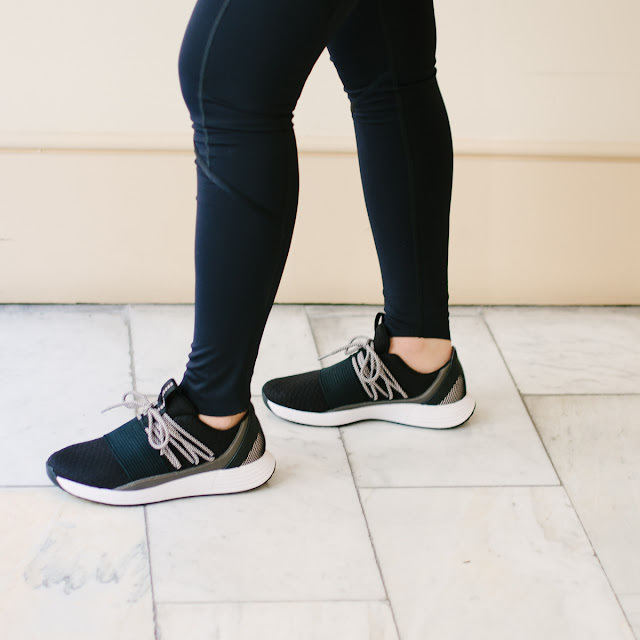 Well, after a few weeks of wearing these Under Armour pieces I am OBSESSED (this is not a sponsored post!). 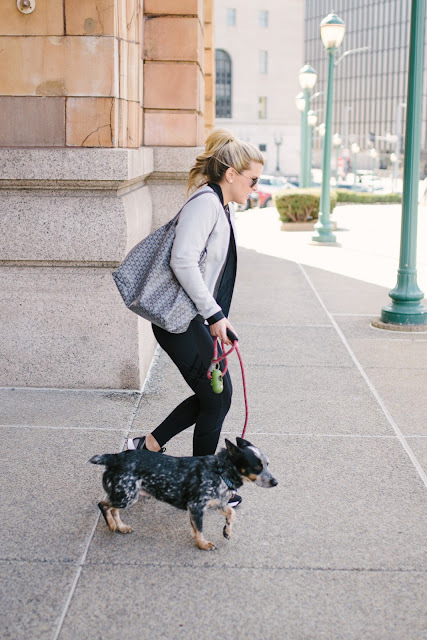 I've actually found myself reaching for the leggings over my Lululemons! They fit perfectly, are very comfortable with a high waist, have large pockets on both sides of the legs, and cool design on the sides! This is the outfit I have been wearing when running errands or walking Henry. If I am out running a ton of errands (in and out of the car) I typically wear some sort of athleisure so I'm comfortable. I'm always in sneakers when walking Henry! DSW partnered with Under Armour so these sneakers are a collaboration between the two brands. I wore them while traveling to Charleston and then on my way home from Charlotte. I always get soooo many steps in when I have to go to the airport so sneakers are usually a must for me. They were super comfortable and I felt really 'cool' in them because of the sleek design. The bomber jacket is something I would have never in a million years picked out for myself but I am in love! I feel so chic and the gray is nice to break up all of the black. 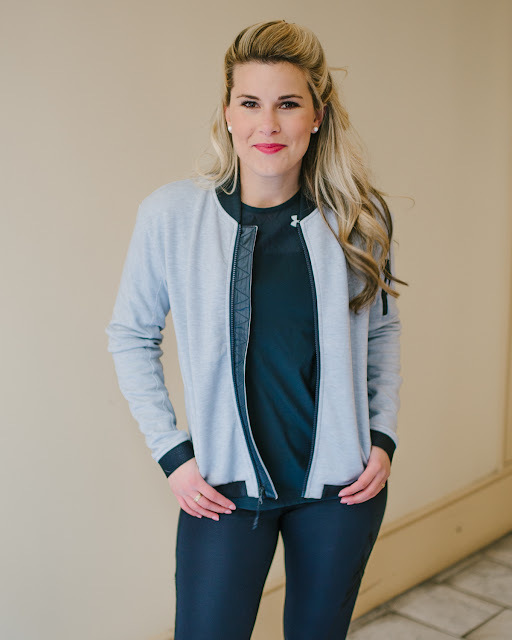 I typically stick to black workout pieces so I can mix and match but also tend to add in more neutrals like white or gray so this bomber jacket fits right into my mix. 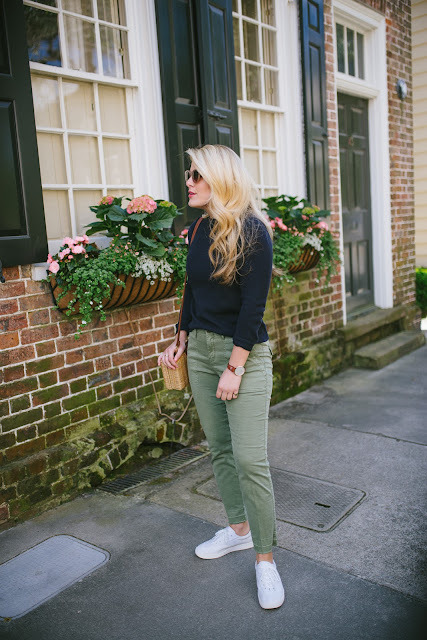 A lot of you request (on instagram) to see more athleisure outfits and errand outfits. Is this something you would also like to see here? I'm happy to share! I typically don't share too often because they're never too exciting but let me know! Happy Saturday, everyone! Do you have any fun plans? This weekend I am taking it easy (my favorite way to do a weekend!). It's a family friend's birthday dinner tonight but other than that, it will be relaxing and catching up on work and errands. I'm excited because tonight we are checking out a new-to-me restaurant in Lawrenceville, a neighborhood I don't frequent enough! I feel like I've had a very busy month so it will be nice to stress less this weekend! I have been browsing a lot online and found SO many good things this week, I just have to share! I got so many requests to share everywhere Katie and I went while we were in Charleston, so here is my full Charleston dining guide! The city is a foodie's paradise. Literally, every single thing I have ever eaten in Charleston has been wonderful. You can see past favorites like Zero George and Cannon Green, too. If you are wondering where to eat, you can't go wrong at any of my below recommendations. We didn't have a bad experience anywhere. Everywhere the service was wonderful and everything we ate was better than the next! In regard to reservations, if you can, I would suggest making a reservation. During the weekdays, they're likely to be less crowded but on the weekends it will be hard to get a table! A casual but refined spot near King Street that serves classic southern food in a modern way. We had things like pimento fried cheese balls. Everything we ate was wonderful as was the service and the presentation. I'm not much of a biscuit person, but their biscuits alone are reason enough to go. SO good. There's also a beautiful deck, so if the weather is great, ask to be seated there! A cute local coffee shop with a hipster vibe. They have delicious French press option! The branding is just as amazing as their food. An eclectic, seafood-based menu, with things like oysters, lobster rolls, and more. It would be great for a date night, a girl's night out or even with family. Stop in for drinks and some snacks at the raw bar or for a seated dinner. We sat at the raw bar and had oysters and shrimp then, a lobster roll with hushpuppies. YUM! Their cocktails are also fabulous and worth ordering over wine or beer! Make sure you grab a few matchbooks on your way out. They might be the cutest I've ever seen! This is a hotel with a restaurant and bar/lounge attached. We did not eat at the restaurant but it looked lovely. We had drinks in the lounge and it was though we stepped onto the set of Mad Men. It has a very clear Mid-Century modern vibe with a bit of upscale swankiness to it. They had a live trio which made it even better. The drinks were beautifully presented and delicious. We stumbled into this bar/lounge by accident but we ended up loving it. They had a live jazz singer and the ambiance was very cozy and romantic. They specialize in wine but have a few cocktails to choose from. We also had their flatbread which was perfect and great to split between the two of us as a snack. This would be the perfect date-night spot. This is one of my all-time favorite spots. I've been here before and knew I had to go back. They also have a spot at Cisco Brewery on Nantucket and I made sure to stop there, too. It's the best lobster roll I have ever eaten. Not to mention, their tuna tartar and guac are incredible, too. If you have time for just one lunch, this should be it. This is a popular bar as we entered and almost couldn't find a spot to sit. It has a college-vibe to it but it's well worth the visit even if you are well out of college. The cucumber gin drink that I had was one of the best cocktails I've ever had! If you are a Greek food fan, this is the place for you. Everything from hummus to Gyros, Stella's is a more upscale Greek restaurant with a pleasant, simple atmosphere. The cocktails are also delicious (I had the Onassis) and the food portions are huge. It's a great place to go with a group and share everything! This was my favorite dinner in Charleston! Callie and I went when she got into town and it was BEYOND. The location and interior were beautiful with a casual but luxe vibe. The menu specializes in seafood. We got the tuna tartar, baked lobster, and crab toast. It was so good we could have licked the plates. If you only have time for one nice dinner, this would definitely be my choice! This is an unassuming pub, but the real gem is their courtyard in the back. It's picture perfect for lounging and sipping one of their delicious cocktails, but would also be the perfect spot for Sunday brunching. Their menu is vast and all of the choices sound amazing, it's hard to choose. The food is casual American and you could easily show up in a sundress or your post-yoga leggings. Wow did this week fly by! I actually cannot believe it is Thursday already. I'm excited for the weekend, but still have a lot of work to do before I get there. On Tuesday evening, I spoke at Duquesne University students about SEO (search engine optimization) and it was a lot of fun. I always psych myself out before I speak in front of a group, but once I'm doing it, I remember how much I really enjoy it! Wednesday I got together with one of my BFF's, Aly. She has been away for a while and it was so nice to catch up with her! Tonight, if I can make time, I am going to head to Homegoods to see if I can pick up some more 'cheap' toys for Henry to destroy. I've felt a bit guilty/bad for him. He's been cooped up inside a bit more than usual this week becuase of the snow and I can't wait for him to experience warmer weather here and take long walks with me! 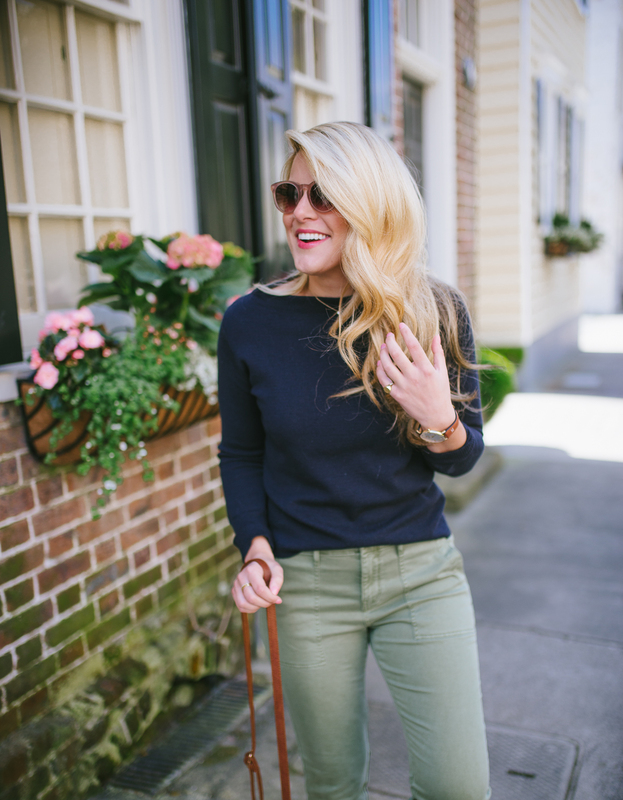 Wearing: While in Charleston, Vineyard Vines invited me in to check out their King Street shop! It's a beautiful store with a great location. I was excited to see all of the beautiful pieces in person. I picked up this navy bomber jacket and I am OBSESSED. It's probably not something I would have chosen from just seeing it online, but after trying it on in person, I knew I had to have it! 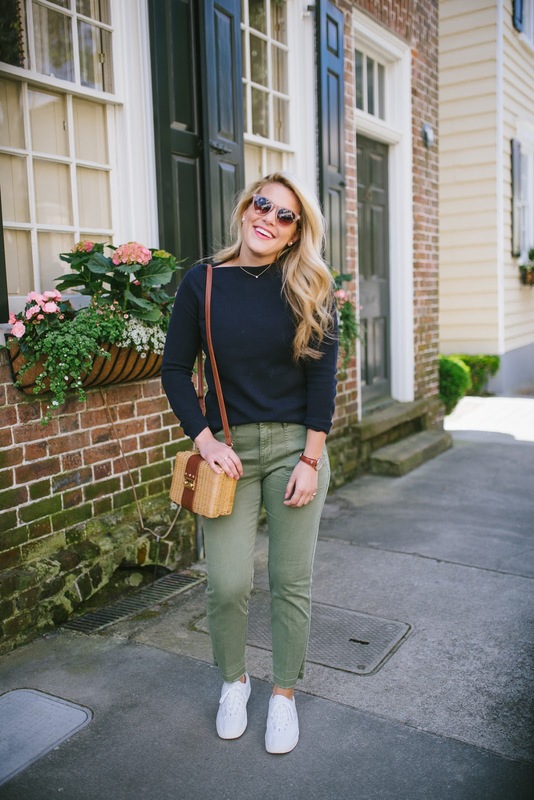 VV has sooo many great pieces out right now, I want them all! Scroll through the widget above to see some of my favorites! Reading: This was such an interesting article about healthy eating. It's SO hard to navigate eating and nourishing yourself in 2018 because of all of the fad diets and food trends out there. This article is really long, but easy to digest in Q+A style form with a doctor. It's so eye opening. But basically, the overall vibe of the article is to eat less meat and more of a plant-based diet. I kind of knew that already, but I do love my meat! Here's to me preparing more vegetarian meals! Watching: The trailer for the Mr. Roger's movie, 'Won't You Be My Neighbor' has been released! I absolutely cannot wait to see this documentary. I am such a fan of everything Fred Rogers. He is a truly inspiring man and a Pittsburgh icon. I watched Mr. Roger's growing up as a child, and was fortunate enough to be able to see some of the set up close and personal here in Pittsburgh. My Pappap (my mom's dad) was a musician and he actually used to play with Joe Negri (Handyman Negri!). There's also a biopic with Tom Hanks coming out and I can't wait for that, too! Loving: Lilly Pulitzer and Pottery Barn collaborated on a line of housewares and it's realllllly making me wish I owned a beach home somwhere warm and tropical! They do have some understated pieces, though, like this sham and this adorable little gold seat turtle box! I also need to find a place to put this mirror, stat, because it is absolutely gorgeous! Loving II: Are these not the cutest sandals ever?! I got them about a week ago but haven't had a chance to wear them since it's been ridiculous here in Pittsburgh (read: snowy and frigid). Wanting: Scroll through to see some of my favorites from this week. I have a lot! Quoting: 'Mindset is what separates the best from the rest.' // See more of my favorites, here. My blue additions to my bedroom are well underway! I just got this pillow in the mail and it's basically what inspired me to add some blue to my all-white/neutral bedroom. I'm seriously in LOVE with the pillow- the quality is superb so I'm happy for it to be the focus of my bed! 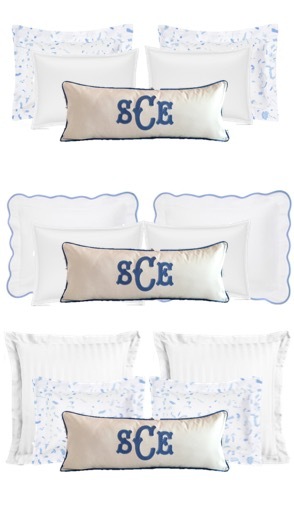 So, today I'm coming at you with combinations of pillows. When I originally moved into my apartment, I mocked up everything and did it to scale. I'm not the best when it comes to interior design and I'm much more of a visual person, so seeing things 'mocked up' really helps me. 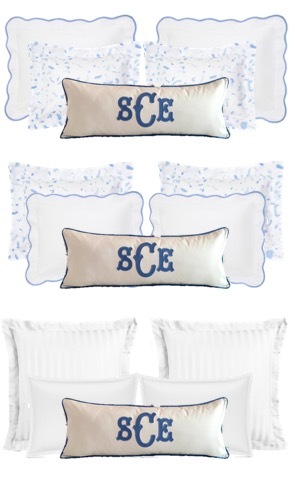 I have a few pillows in mind but I wanted to see what combos you prefer, too! Keep in mind that since this is such a rough mock-up, all of the blues will match and the whites are all the same shade, too (bright white)! They're just not picturing well as mockups. I know which one I am leaning towards, but I'll keep that to myself so I can gauge your opinion! I know many of you have good interior design eyes because you have helped me in the past with decisions like this! Lastly, I am pulling the blue in with this throw, these coasters, and this tissue cover! I can't wait to see it all come together, it's the perfect dose of calming color for spring! 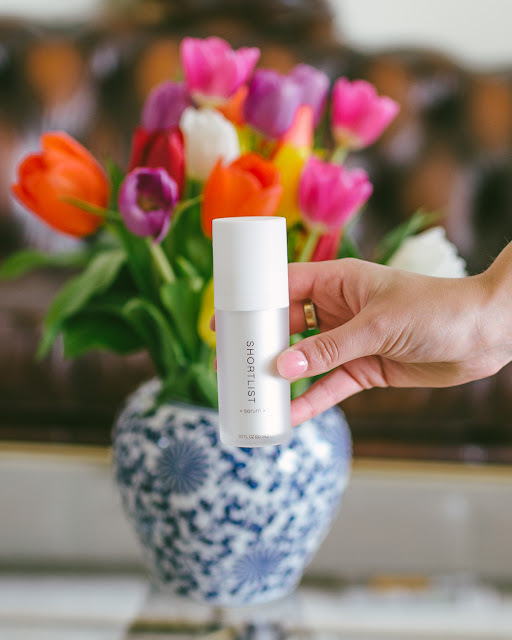 Whether I'm traveling to a different state or different country, running errands, or visiting my parent's house, I am always on-the-go. I have my home base, but I'm usually not there much! Because of this, I carry a lot with me and am always prepared. So today, I'm partnering with Barrington Gifts to share 5 things that are crucial to have with me at all times! 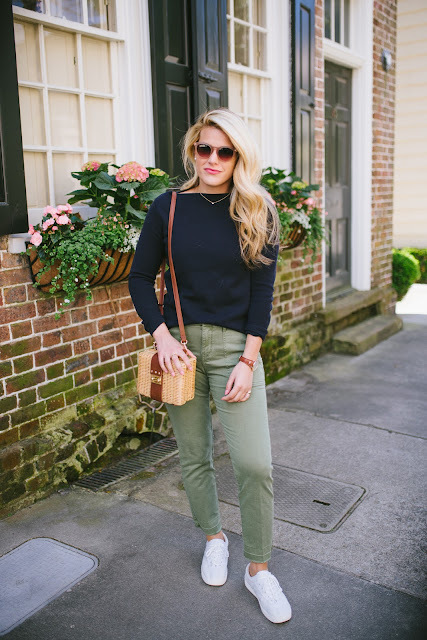 A Good Tote// Finding the best tote to fit your lifestyle is similar to finding a pair of jeans that fit just right... it's tough. My newest tote is this Barrington Gifts Nantucket Tote. I have so many of Barrington's totes and I love them all. 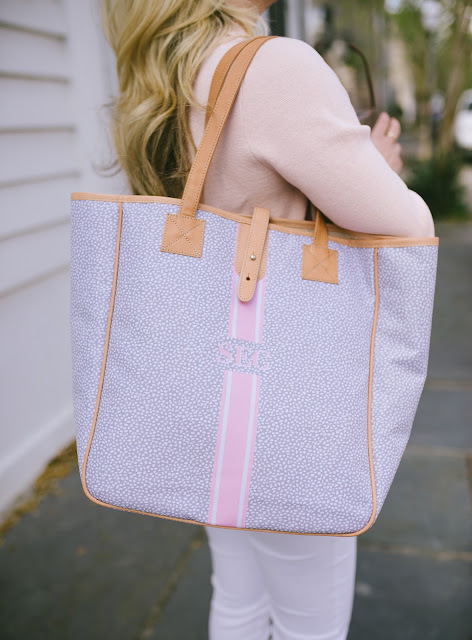 I find that the St. Anne tote is great as an everyday handbag, the Yacht tote is the perfect travel bag, and the Belmont Cabin Bag is a perfect weekender. 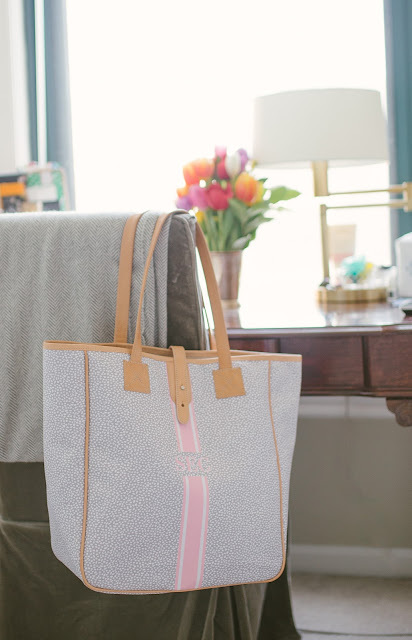 My current favorite tote, though, is the Nantucket tote. I just received it from Barrington a few weeks ago and it has been my go-to bag. 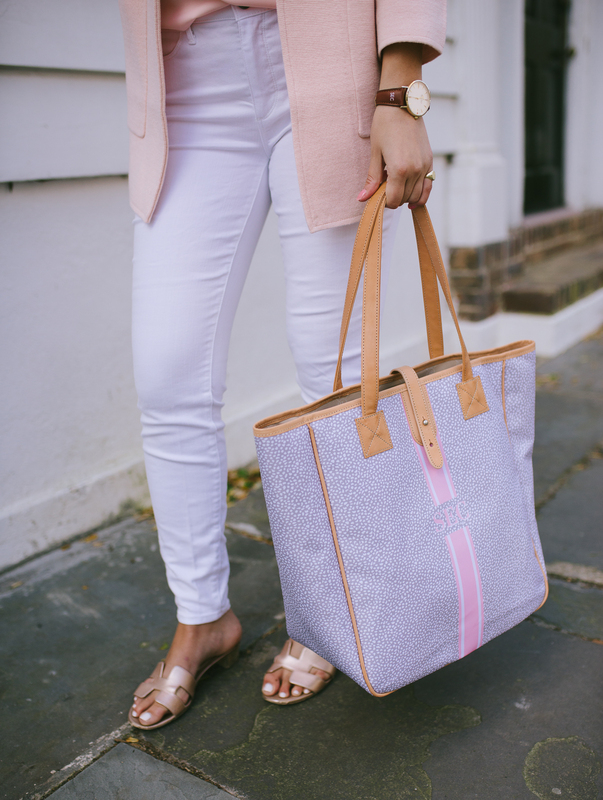 I carried it as a carry-on to Charleston and I loved it because it has so many pockets to stay organized. 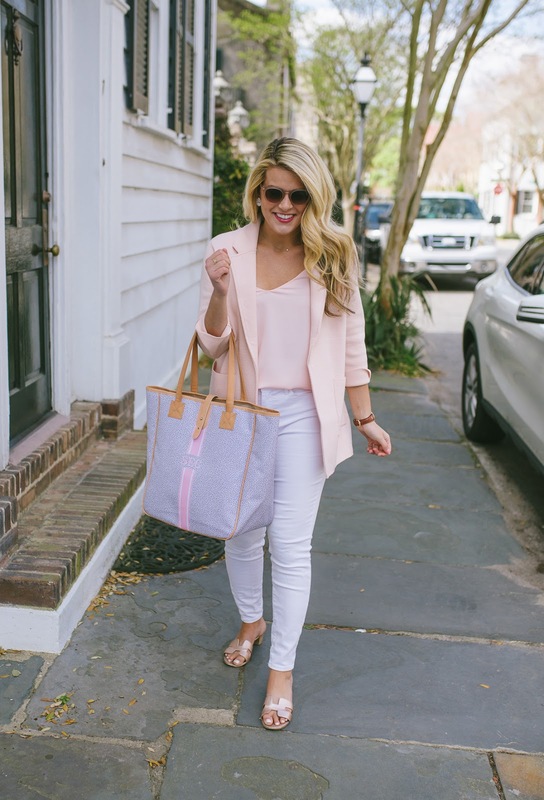 While in Charleston, it was the perfect tote for walking around the city. I was able to carry more than enough! And at home, I've been using it as my on-the-go tote as it holds my computer, camera, notebooks, and a big bottle of water. Other pieces from Barrington that I love: this laptop sleeve and this luggage tag. 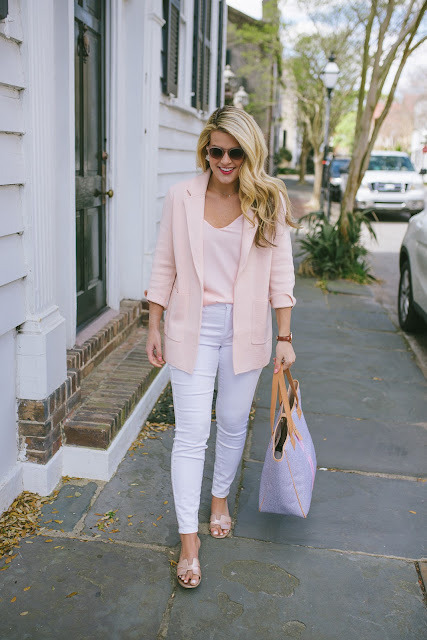 With graduation season coming up, I think these two items are great graduation pieces and they are both priced well under $100! Portable Phone Battery// Since a large part of my job is social media, I am always on my phone and therefore, it's always dying. A portable battery is always with me. If I am traveling, I sometimes bring two or three, just in case. Snacks/Water// Hangry is a very real thing for me. I get so mean and irritable if I am very hungry so I'll usually carry around a granola bar/protein bar, a piece of fruit (usually an apple), and a string cheese. I also have some sort of sparkling water with me (passionfruit La Croix is my latest obsession) and sometimes either coffee or flat water. 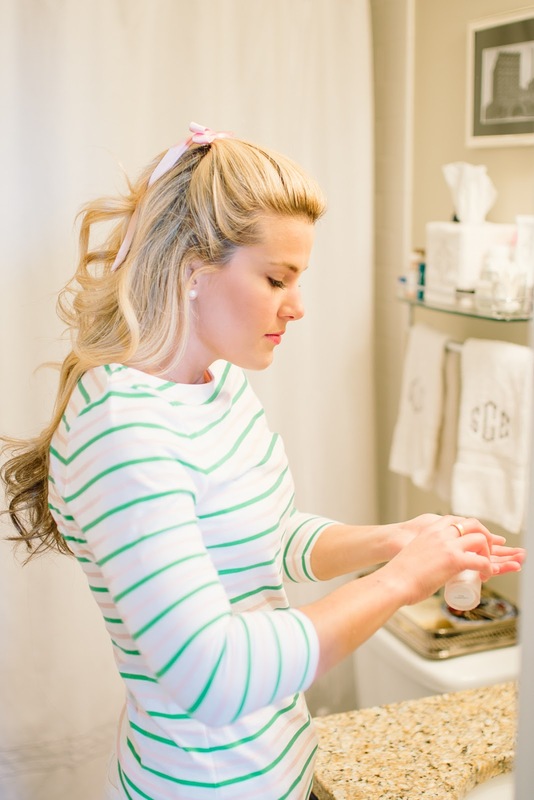 Beauty Touch-ups// I don't like to carry around all of my makeup, but typically, I carry a translucent powder, lip color/balm, and concealer. That way, if something comes up while I am out, I am able to freshen up a bit. I'll also sometimes be at my parents all day and then head to dinner with them, so it's nice to have things on hand so I don't need to run home for any reason! I write about my love for travel wraps all the time. But, I seriously can't go without them. In the winter they can double as a scarf and in the summer they can act as a blanket when you're at your desk and the air conditioning is on full-blast. Being cold makes everything miserable so I'm always prepared! Thank you to Barrington Gifts for sponsoring this post. As always, all opinions are my own.